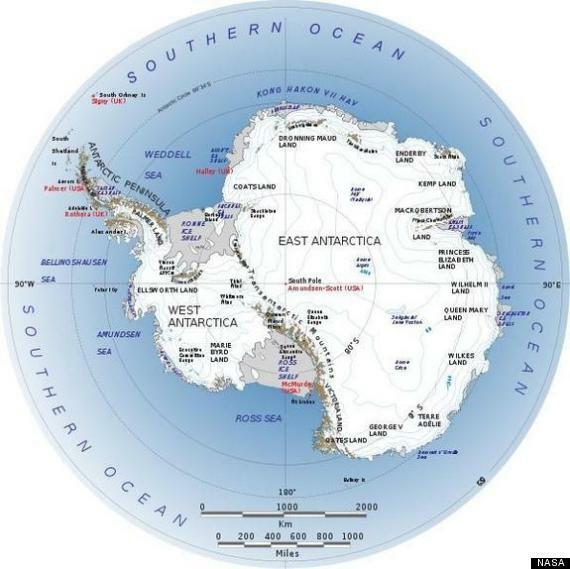 The discovery finally confirms long-held suspicions of volcanic activity concealed by the vast West Antarctic Ice Sheet. Several volcanoes poke up along the Antarctic coast and its offshore islands, such as Mount Erebus, but this is the first time anyone has caught magma in action far from the coast. Two earthquake swarms struck beneath the researchers’ feet in January 2010 and March 2011, near the Executive Committee Range in the Marie Byrd Land region of the continent. As the researchers later discovered, the tremors — called deep, long-period earthquakes (DLPs) — were nearly identical to DLPs detected under active volcanoes in Alaska and Washington. The swarms were 15 to 25 miles (25 to 40 kilometers) below the surface. “It’s an exciting story,” said Amanda Lough, the study’s lead author and a graduate student in seismology at Washington University in St. Louis. Though there were no signs of a blast, a 3,200-foot-tall (1,000 meters) bulge under the ice suggests the volcano had blasted out lava in the past, forming a budding peak. 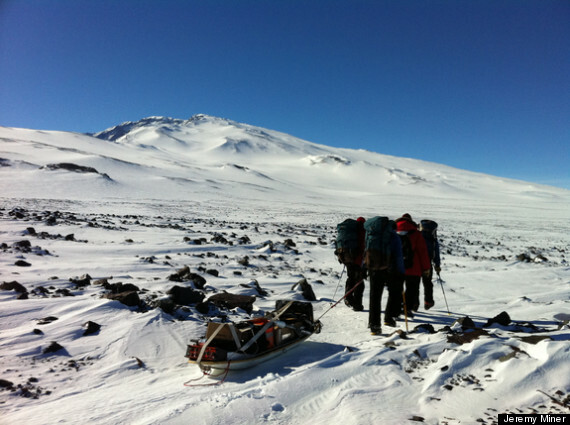 The POLENET/ANET field team drags equipment to install remote seismic and GPS stations at Mount Sidley, a volcano in Antarctica (seen in background). Scientists think that underground magma and fluids pushing open new paths and fracturing rock cause deep, long-period earthquakes. Many active volcanoes in Alaska’s Aleutian Islands have frequently produced these deep earthquake swarms without any signs of impending eruptions. However, researchers also monitor the tremors because a sudden uptick in shaking was seen before eruptions at Mount Spurr and Mount Redoubt in Alaska. If the volcano in Antarctica did erupt, it would melt the bottom of the ice sheet immediately above the vent. Scientists aren’t sure what would happen next. In Iceland, volcanic eruptions can melt glaciers, causing massive floods calledjökulhlaups. But the ice above the Antarctic volcano is more than a half-mile (1 km) thick. “How West Antarctic ice streams would react to an eruption a hundred or more kilometers [60 miles] inland from the grounding line is a yet-to-be-answered question,” said Stefan Vogel, a glaciologist with Australian Antarctic Division who was not involved in the study. The grounding line is the spot where glaciers detach from rock and float on water. “There is certainly a need for more research, both in mapping the distribution and monitoring the activity level of subglacial volcanic activity beneath ice sheets, as well as studying the impact of subglacial volcanic activity on the hydrological system of glaciers and ice sheets,” Vogel said in an email interview. Instead, the millions of gallons of meltwater might simply hasten the flow of the nearby MacAyeal Ice Stream toward the sea. Hugh Corr, a glaciologist at the British Antarctic Survey who also discovered a buried Antarctic volcano, said an eruption could have a big effect, but it’s difficult to quantify. “The biggest effect on the West Antarctic Ice Sheet is still climate change — warming the ocean, melting the ice shelves. That’s the most immediate risk, compared to if a volcano might go off,” said Corr, who was not involved in the study. “The [West] coast of Antarctica is like a ring of fire,” Corr said. 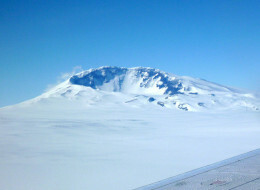 The Executive Committee Range in West Antarctica is home to a newly discovered active volcano. Let’s set the scene. Antarctica is split by an incredible mountain range. Imagine if Utah’s spectacularly steep Wasatch Mountains cleaved North America from Texas all the way to Canada. That’s what the Transantarctic Mountains are like. In the West, the land dives off into a deep rift valley, where the crust has been tearing apart for about 100 million years. The newly found volcano sits on the other side of this rift, in a higher-elevation region called Marie Byrd Land. While the torn crust may seem like the best explanation for Antarctica’s many volcanoes, many of the peaks fit no obvious pattern. Rifting and volcanism in Antarctica could be like nowhere else on Earth. “What is going on with the crust in Antarctica is still puzzling,” Lough said. Email Becky Oskin or follow her @beckyoskin. Follow us @OAPlanet, Facebook &Google+. Original article on LiveScience’s OurAmazingPlanet.